Ring in the new year with a batch of penguins ready to par-tay!! We like to put them in party hats and frilly toothpicks. To make the hat, cut a triangle of carrot about 1/2″ to 5/8″ high and 3/8″ wide (these are not strict dimenions, of course… just a guideline). To place the hat, cut a slit just in front of the toothpick and insert the hat. For a more complete New Year set, make Father Time and Baby New Year penguins! Baby has a roasted yellow pepper sash and carrot top hat. Father Time has a cream cheese beard and a roasted red pepper sash. 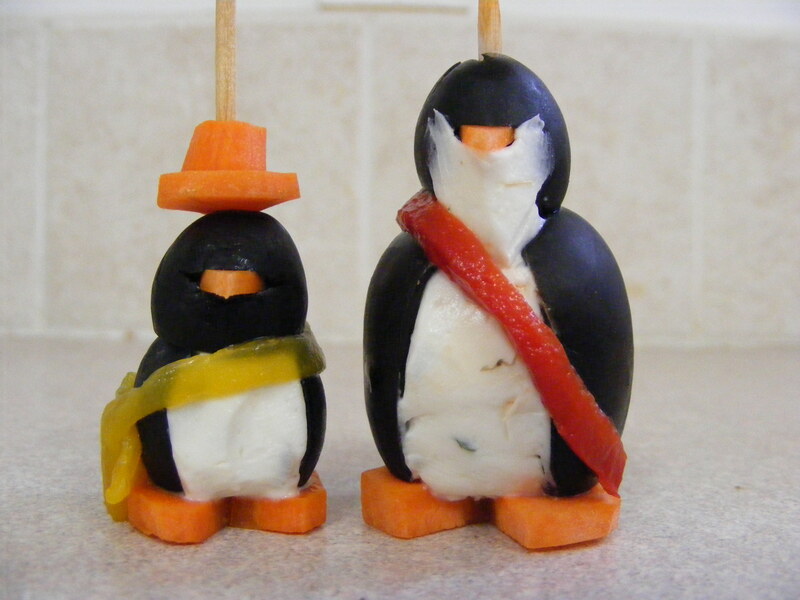 For the sashes, slice very thin pieces of roasted pepper, about 3-4″ long, and wrap one around each penguin. 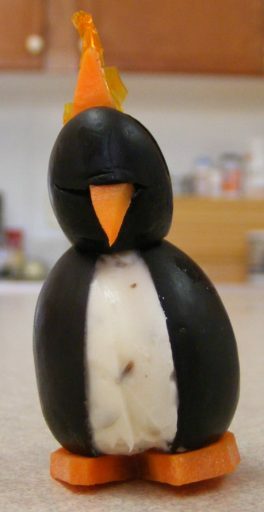 The top hat is a bit of the skinny end of a carrot (about 1/8″ tall) on top of a thin slice of carrot. When making the hat, put it on the toothpick first, then secure the rest of the penguin. The beard is a plop of cream cheese under the beak, smeared up to make it look more beard-like.